Healthcare from United States, come on down! Welcome to “They Price It Right!” There goes the industry, high-fiving all the other industries in the studio as it rushes towards Drew Carrey and the stage. And pays the ransom. In 2017, healthcare organizations accounted for 15% of all security incidents and data breaches, second only to financial institutions (from Verizon’s 2017 DBIR). 66% of malware was installed through either email links or attachments. The healthcare industry has also been hard hit with ransomware in recent years. The last several years have seen a dramatic increase in ransomware within healthcare. To quote the CEO of an organization that DID pay out the ransom demand, “These folks have an interesting business model. They make it just easy enough. They price it right.” Symantec’s ISTR on Ransomware 2017 reports the average ransom demand “appears to have stabilized at US$544 indicating attackers may have found their sweet spot.” Ahhh…can just picture the blackmailer getting a notification that their target had succumbed and paid up…that hit the sweet spot. However, a reminder; a $500 ransom may not seem much to an organization with millions or billions in revenue, but that’s per infection (sorry, pun not intended as we’re discussing the healthcare industry). Dozens or hundreds of infection can easily tally up the ransom to total in the tens or hundreds of thousands. Furthermore, paying the sweet spot ransom does not guarantee even a bittersweet outcome. 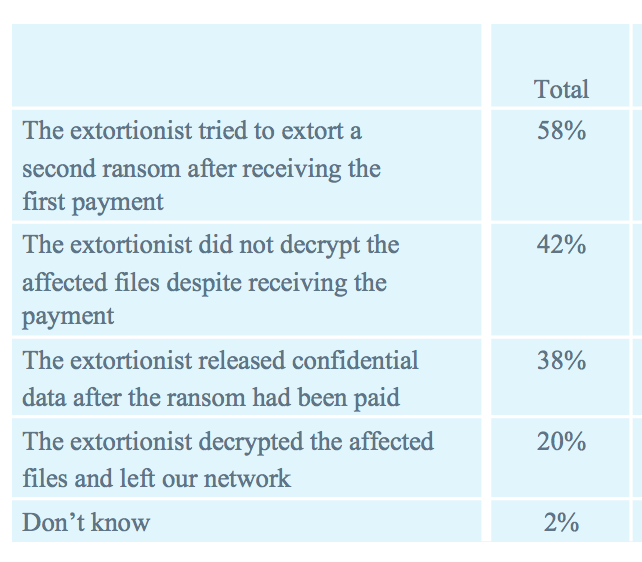 SentinelOne’s 2018 Ransomware Study shows 42% of ransom payments did not result in data recovery. 58% demanded a second payment. Technology has come a long way – email filters, domain verification, Sender Policy Framework, malware and link scanners – plus many more help in filtering out the 50-70% of the email traffic that is spam. But they still get through. I know for one my Inbox is not spam-free or devoid of any phishing messages. Since technology is not at the point where it’s able to stop all phishing email, it is up to the user to NOT click on that link or attachment. Sure, there are technologies that prevent bad things from happening if a user DOES click on a phishing link or malicious attachment. But then again, technology is not at the point where they are 100% effective. Businesses with big budgets buy all kinds of hardware and software solutions to try to counter phishing. But they ignore a big piece of the phishing attack model, and that is the end user. And here, education and training is imperative. Repeating phishing exercises should be conducted on all or selected groups of employees. These campaigns should be at not-too-regular intervals, so as not to evoke an anticipation from the employees – alright, here come some vaguely suspicious email on the first day of each quarter; I’ll just delete them. Then the rest of the year, they blatantly open, view and click on any and all email links. The simulated campaigns should be randomized and as unexpected as possible. Then there needs to be a culture of non-retribution. Phishing exercises should be conducted with learning as the objective. Employees should come away with a heightened awareness of phishing and the social engineering tricks used by phishers that make you just want to click that link/attachment. Employees should be encouraged to report any suspicious email so that word gets around. Homeland Security’s “See something, say something” campaign applies here too; someone is perhaps targeting your firm, alert your fellow colleagues. This entry was posted in End-user Focused, General InfoSec, Information Security Training by Johnny Chuah. Bookmark the permalink.